This course provides pilots seeking approval for operations at the Innsbruck Airport with familiarization of all aspects of operations. 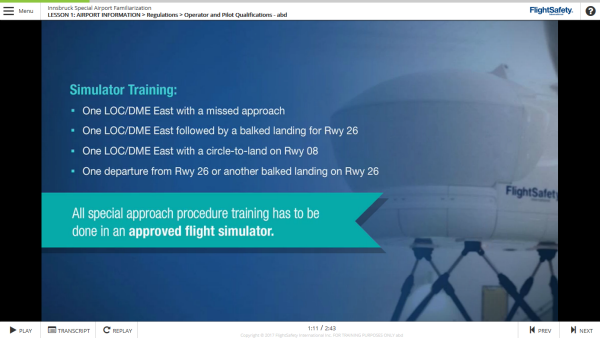 Included in the 1.5-hour eLearning ground school are the Articles required for authorization, AFM limitations, performance planning and criteria, importance of thorough pre-planning for each arrival and departure, CRM issues regarding these operations, aircraft-specific procedures, and aircraft-specific performance calculations. The 1.5-hour simulator portion allows pilots to practice the demanding procedures required to gain confidence and proficiency. Pilots will receive a Record of Training indicating the specific training completed. This course provides highly-focused training. However, it does not provide authorization for operations at Innsbruck Airport. The Operator is responsible for contacting Innsbruck Airport Operations to obtain any required approval for operations. Prerequisites – The following airplane and pilot requirements must be met prior to the course. Commercial Pilot License or ATP Certificate. 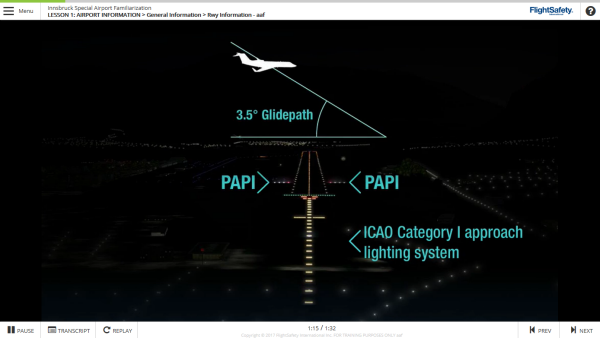 The Pilot must be operating an aircraft which it’s National Authority of registration has approved the required AFM Annexes for the Approaches. 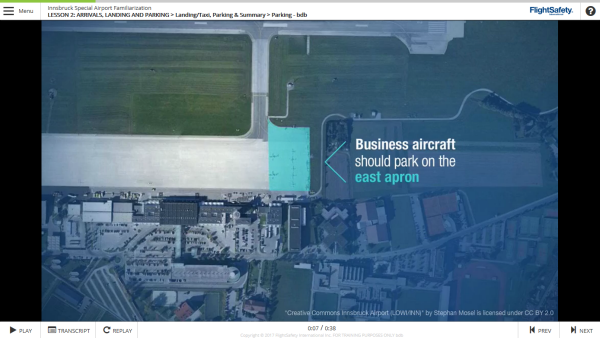 The Operator is responsible for contacting Innsbruck Airport Operations to obtain any required approval for operations. Pilot must have a type rating for the aircraft matching the simulator the training is conducted in. 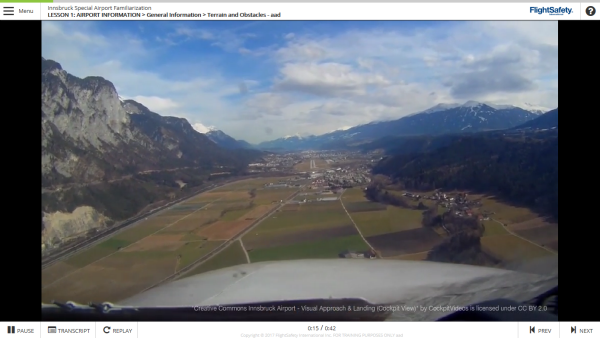 Lesson Objectives Simulator: This simulator session reinforces material presented in the Innsbruck Airport Familiarization ground training segment. The crew will practice selected arrivals and departures at Innsbruck Airport using the guidance from the aircraft-specific AFM, Innsbruck Airport rules, and the AIP Austria. Human factors and CRM issues will be exercised.